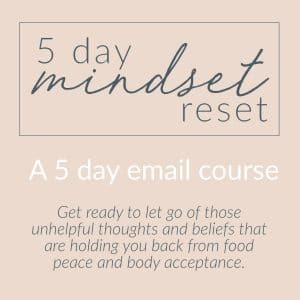 Struggling With Intuitive Eating? Have You Checked That You Are Getting The Basics? I’ll be honest, Intuitive Eating is not always a walk in the park. Rejecting diet culture, tuning in with curiosity to the physical sensations your body sends you, letting go of food rules and learning to accept the body you currently live in requires active, hard work. Of course, the payoff for all that hard work is food and body peace, so it is well worth it! But there can be times (especially when first starting out) where you feel like progress is one step forward and three steps back. It makes sense that progress can feel slow and clunky. Or that you are stuck, or things are going backwards. So, I can understand that during these times, Intuitive Eating can feel like this is another thing you are failing at. But before jumping to that conclusion, how about checking in with yourself to see whether you are getting the basics? What are the basics? Let’s explore below! are you getting enough nourishment? As much as I believe food is more than just fuel, our bodies DO rely on food to function optimally. So, dieting, restricting food and ignoring hunger are guaranteed ways to cause your body to become run down and make it more difficult to tune in to those signals of hunger, fullness and satisfaction. Choosing the foods to eat that YOU need to function well is key here – being aware that this may look different for everyone. For some people eating more carbohydrates are needed, for others it is including animal protein in their diet. There are no right or wrong choices here, but if you are not sure how to do this, working with a non-diet dietitian can help. People like to brag about how late they stay up working, or about how few hours of sleep they are functioning on. But getting enough restorative sleep is a ‘basic’ your body absolutely needs. You can throw intuitive eating out of the window if you are sleep deprived – it is almost impossible to be attuned to your body when you are having trouble just keeping your eyes open! These tips from Inner Melbourne Psychology are a great place to start if you are looking for ways to get a better night’s sleep. You have probably read a million times that by the time we physically feel thirsty, our bodies are already dehydrated. Just like with food, our bodies work well when they are hydrated (I know I get horrible headaches if I don’t have enough to drink). How does this impact on intuitive eating? Well, our brains can start to jumble up how it deals with hunger and thirst once we become dehydrated and may send hunger signals out to the body urging it to EAT rather than have something to drink. Obviously, this isn’t helpful when we are trying to become more attuned to those signals if they are mixed up in the first place! If water is not your jam, remember all types of fluids help with hydration – tea, soup, juice, milk, even coffee (yep, it is a myth that coffee is dehydrating). are you getting enough time for YOU? Work/life balance has become a bit of a unicorn these days, so much so that a lot of people believe the concept is a load of BS. But I would encourage you to have a look at how many hours you are working every week (this also includes work you do at home – whether that be paid work or managing the house). Do you say Yes to everything? This may be work OR it could be saying yes to every social engagement you are invited to. Being constantly on the go or burning the candle at both ends can crowd out those little pauses we take during the day to check in with what is happening in our body making it more difficult to connect with what our bodies truly need. Consider instead, what do you do to relax? What are some things you can let go of to carve out some ‘you’ time? This one may seem a little controversial to include here because working on intuitive eating often means re-evaluating our relationship with exercise, and in some cases easing off the exercise accelerator. In the context of getting the basics, I am not referring to planned exercise at all. Rather than seeing movement as getting out and clocking up 10,000 steps a day (which is soooo steeped in the diet mentality), I am talking more about doing some stretches if you have been sitting at your desk for ages or taking a walk outside for five minutes to get some fresh air. As you can see, without getting ‘the basics’, your ability to connect with your body can be just that little bit more difficult. 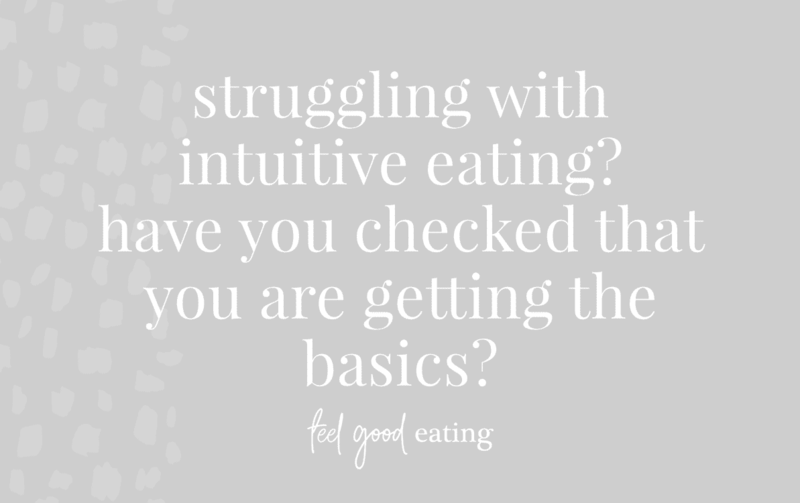 So, if you are finding your intuitive eating practice feels like a struggle, come back and re-visit these basics and check in to see if there is an area (or areas) that could do with some extra compassionate care. what do you find difficult when you don’t get the basics? Great post! Even when my clients are better at hunger and fullness regulation, it’s still rejecting the diet culture that is hard to get over! These are such great reminders for healthier living! This is such a good post. I need so many of the basics. The work/life balance thing is something I wish I could work well on. I know I would be so much better off if I was able to sleep better and take care of myself better. Thanks so much. Yes it can feel hard to break that cycle when you are so used to taking care of everyone else first.